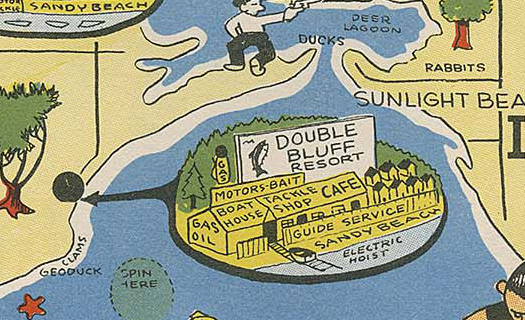 Double Bluff Beach Club has a rich history and was located next door to the original "Johnson's Double Bluff Resort." Below is an advertisement from the 1950 "Gabby's Gay Guide to Fun & Fishing in Central Puget Sound" which details the uniqueness of this area. "JOHNSTON'S DOUBLE BLUFF RESORT. Located 2 miles north of Bayview Corner (watch for sign), turn left 2 miles to resort. One of Whidbey Island's most popular fishing resorts. Fly fishing for Silver Salmon as well as spinning are featured here. 8 modern cabins for parties large and small. Everything furnished except bedding and dishes. A new Cafe has been opened for the convenience of the fisherman, serving early breakfasts as well as complete dinners. 33 boats, kickers, inboards and skiffs. Marine railway for launching. Tackle store where fishing supplies may be bought and rented. Live bait in season. Safe sandy beach for children. Gas and oil service for cars and boats. Seaplanes may land here. Guide service. Crabs, geoducks, clams and bottom fish. Esther and Crawford Johnston, Owners, Rte. 1, Langley. Phone Langley 273." "WHIDBEY ISLAND, the second largest island in the United States. Over 50 miles long with scenic attractions unsurpassed. Beautiful views of the sno- capped Olympic Mountains to the west and the Cascades to the east. Deception Pass State Park at the north end of the island is a sight you will always remember. Sheltered bays and harbors with wide, gently sloping beaches are an invitation to all kinds of beach and water sports. Large ocean liners entering and leaving Puget Sound, pass close to the shores. Pleasure boats find the calm waters around Whidbey Island ideal for cruising, and are seen here during the summer months by the thousands. WHIDBEY ISLAND'S fishing grounds are famous throughout the northwest. Tidal eddies and currents around the various points and bays of Whidbey Island teem with small herring and candlefish, forming a natural feeding ground for all types of game fish. Salmon Fishing is at its best in these waters. Fly fishing for Silver Salmon is a sport becoming more popular each year. Bottom fish, clams and crabs are plentiful. Deer are quite common, rabbits may be hunted all year. WHIDBEY ISLAND welcomes you." DOUBLE BLUFF RESORT changed management (and/or ownership) and was charging ahead as a series of advertisements were placed in the Spokane Daily Chronical in the spring of 1955. 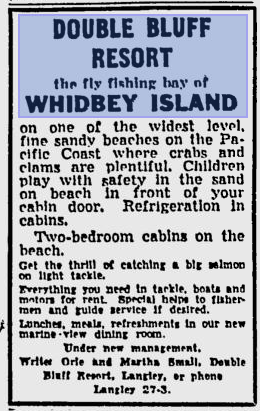 Interesting to think of Useless Bay/Double Bluff as "the fly fishing bay of Whidbey Island." "DBBC was built by Wanda Well's father when she was a young girl, and not part of the (Double Bluff) Resort. All three of the homes between the park and bluff were always in private ownership, and built by their owners, who floated in materials. At the time of construction, the waterline came within feet of the built homes. As the bluff shed sand over fifty plus years, the swirling tidal waters deposited the sand in front of the homes, and the accredited beach made the high tide mark out 250+ feet. It is one of two accreting beaches on the island, and protected as a result. When first built, the private owners had boat houses, ours had rails, and could launch boats into the water. The resort, located where the public picnic area now is, was destroyed by fire. Any remaining fishing cabins were sold, and moved, and the land cleared. One cabin was obtained by a private resident on Shore Avenue, and is still used for storage on the left hand of the road, a small cabin painted green, when I last saw it last summer (2012)."